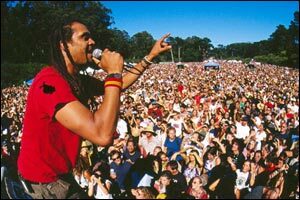 Michael Franti has canceled four concert appearances, the result of emergency surgery this past Thursday, to remove a ruptured appendix. He is currently recuperating at an undisclosed hospital, but is expected to be discharged within the next few days. Michael is expecting his doctor's clearance to return to the road in time for his Friday, July 31st performance in Tulsa, Oklahoma. "After many days and many doctors, it was discovered that my appendix had ruptured," said Michael. "It was removed this past Thursday. It's with deep emotion that I will not be able to perform over the next week or so, especially in places like Calgary, Vegas, Tahoe and Berkeley, where I've been fortunate enough to share my music with so many people over the years. I'm sorry to disappoint, but I will be back as soon as possible. Big love." Michael had canceled his July 23rd appearance at the Calgary Folk Festival and will not perform at his July 24th appearance with the Counting Crows in Las Vegas and appearances in Lake Tahoe, Nevada and at the Greek Theatre in Berkeley, California, also with the Counting Crows. The cancellations come as Michael celebrates the first multi-format hit of his career, "Say Hey (I Love You)," from his All Rebel Rockers CD, the highest Billboard Top 200 Album Chart debut of his career. The single has topped 200,000 in digital sales, a career sales high, and just this week debuted in the Top 10 on iTunes/Alternative Chart.